On Jan. 15, 2018, the Knights of Columbus presented $50,000 to support the future worship space at the new Providence Care long-term care home. This new donation brings the Knights of Columbus’ total commitment to the project is $100,000. The Knights of Columbus also announced another $250,000 in support of local parishes. 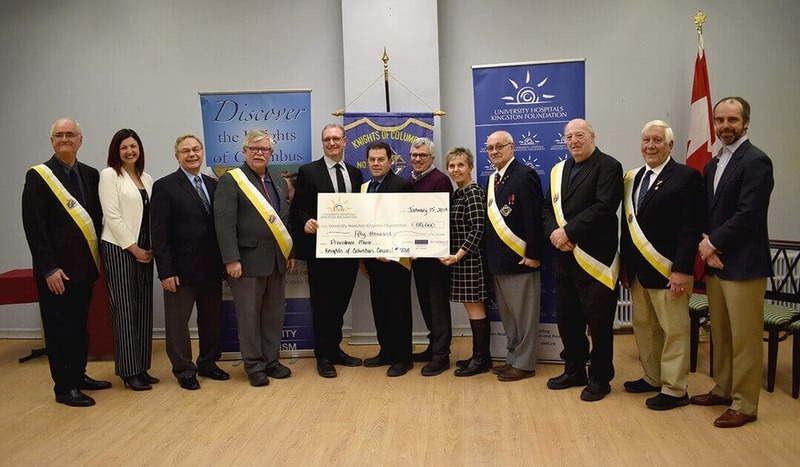 “The Knights of Columbus has more than 800 members in the Kingston region and a long history of supporting important projects in our community. We are extremely grateful for the outpouring of support from our generous members and the community.” said Walter da Costa, member of the Knights of Columbus. Providence Care is planning an exciting future for Providence Manor, by relocating and redeveloping the long-term care home to Providence Village on the Heathfield property owned by the Sisters of Providence of St. Vincent de Paul. Work has already begun on the design stage for this new project. Providence Manor has provided a home for seniors in our community for more than 150 years. The new environment will ensure residents continue to receive compassionate and respectful care in a new state-of-the-art long-term care home, which will meet their physical, emotional, social and spiritual needs well into the future. “This generous donation by the Knights of Columbus and their ongoing commitment of $100,000 will allow us to continue to give compassionate and respectful care in a new vibrant home for residents and their families. It will feature public areas, recreational activities, outdoor spaces, and a worship centre.,” said Brian Devlin, Chair for Providence Care’s Board of Directors. “We would like to thank the Knights of Columbus for their support of this project. This home is an important part of the health care fabric in our region and provides care for hundreds of individuals in our community every year. The addition of the worship space at the new facility will help continue the legacy and tradition that the current facility provides,” said Karen Humphreys Blake, Acting President and CEO of UHKF.